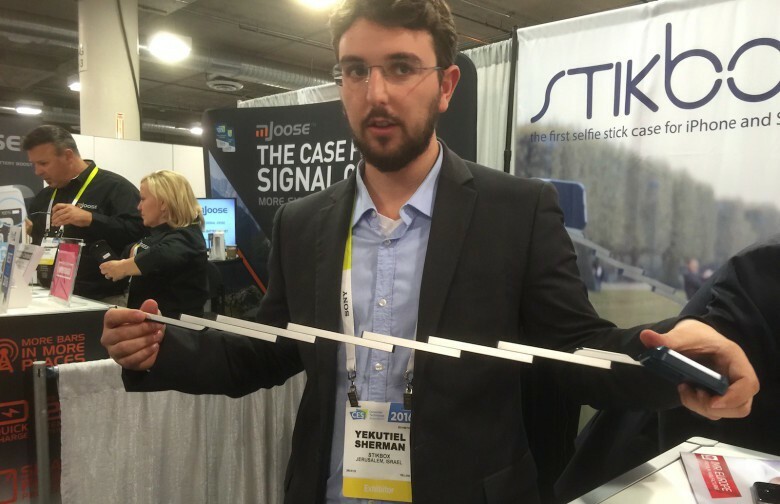 Stikbox founder Yekutiel Sherman shows off his only working prototype of the selfie stick iPhone case. LAS VEGAS — You know your product’s hot when Chinese ripoff artists start selling knockoffs before your first unit rolls off the production line. That’s the “flattering” situation the makers of Stikbox, the world’s “first” selfie stick case for iPhone and Samsung, find themselves in as they demo their only aluminum prototype on the CES show floor here. Stikbox’s Kickstarter campaign launched just two weeks ago, and the unique case hasn’t even been officially manufactured, yet already dozens of clones have popped up online. “It just goes on,” Stikbox founder Yekutiel Sherman said as he scrolled through listing after listing of Chinese manufacturers selling Stikbox clones on Taobao, an e-commerce site owned by Alibaba Group. “Endless, endless,” he said, a mix of shock and dismay in his voice. Finally, a selfie stick that's not completely obnoxious. Selfie sticks receive a lot of hate for being annoying instruments of narcissism. They’re inconvinient to carry around and can make you look just plain silly. A brilliant new selfie stick may have solved the device’s worst problems though with a cleverly designed iPhone case that hides a telescoping 28-inch long selfie stick in the back. It looks like something Data from The Goonies would invent. And for that reason alone, I love it.